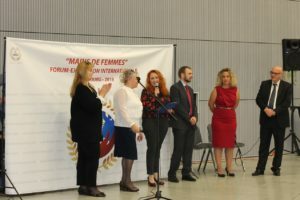 On November 3-4, 2018 in Strasbourg, France (the Palace of Congresses) was held the 1st Annual international forum-exhibition ” Hands of women”. The organizer of the International forum-exhibition “Hands of women” is the Fund for support of cultural initiatives “Zur Art”. International forum-exhibition “Hands of women” was held with the support of the presidential Administration of the Russian Federation (the Fund “Surat” is the winner of the second competition of Presidential grants 2017года Festival of decorative arts “by women”), the Ministry of Foreign Affairs of the Russian Federation, Rossotrudnichestvo, the Ministry of economic development of the Russian Federation, chamber of Commerce and industry of the Republic of Tatarstan, the Russian Public Organization “Business Russia”. FESTIVAL of DECORATIVE ARTS “Hands of women” IN KAZAN. On September 29-30, 2018, the all-Russian festival of arts and crafts “Hands of women” (with the use of the grant of the President of the Russian Federation for the development of civil society, provided by the presidential grants Fund) was held in Kazan, with the participation of 85 masters in the field of arts and crafts from the regions of the Russian Federation. The festival was held with the participation of the chamber of Commerce of the Republic of Tatarstan. At the festival, 15 winners were selected, who were given certificates for free participation in the exhibition program (stand 6 sq.m.) at the international Forum-exhibition “Hands of women”, which will be held in Strasbourg on November 3-4. May 12, 2018g. in the capital of the Republic of Tatarstan, in Kazan in shopping Mall “Korston” will be an International fashion show “Silk Fashion Way”. Silk Fashion Way is an international fashion show of high-level Silk Fashion Way designers-a global project that provides an opportunity to gather the cultural and business community in the capital of the Republic of Tatarstan, in Kazan. Involvement of Italian and Russian designers. The international competition “Woman of the year Top 50 2017” is a complex cultural and mass event aimed at increasing the business social and active role of women in modern society and promoting a healthy lifestyle. 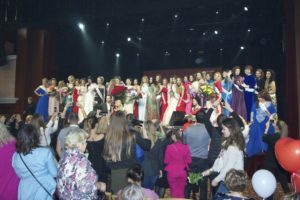 At the International competition the winner is selected, who will represent and embody the image of a successful modern stylish woman in various kinds of business, cultural, charity events held in the Republic of Tatarstan and abroad. 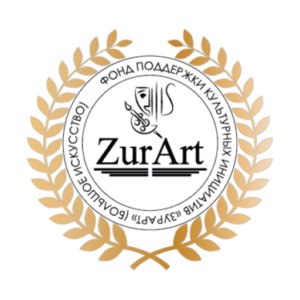 The competition was held with the support of the Foundation “Zurart”. Production and promotion of the site. The Chairman of the jury is Alexander Romanov, ART Director of the Zur Art Foundation, the man who created the first fashion theater in the USSR together with Vyacheslav Zaitsev. The organizer of the first fashion shows in our country on a commercial basis, the Chief Director of the Fashion Center in the USSR.Organizer of international projects in the fashion industry. The owner Of his own modeling Agency and production center. April 22, in Italy, the opening ceremony of a photo exhibition dedicated to the anti-fascist movement. Fund “Serart” (Russia) jointly with the Association of OOD Immortal regiment of Russia and the Association “Humanity in the war” (Italy) have set ourselves the task to convey to the Italian and European audience the historical truth about the events of the second world war, acting under the Resolution of the UN General Assembly A/RES/69/160 on combating glorification of Nazism, neo-Nazism and other practices that contribute to fuelling contemporary forms of racism, racial discrimination, xenophobia and related intolerance. On April 22, in Italy, in Massa, a Solemn opening of a photo exhibition dedicated to the anti-fascist movement during the 2nd World war took place. The photo exhibition will last until may 7. The photo exhibition takes place in the iconic place, in the Martan bomb shelter, located in the historic center of Massa. The bomb shelter was built in 1942 – 1943.d. Venetian miners from Belluno. to protect the civilian population from bombing during the Second world war. As part of the photo exhibition, a road map was signed between the Immortal regiment of Russia and the Immortal regiment in Italy (the Association “Humanity in war”). In the presence of honored guests, old partisans and a large audience, the Association “Humanity inside the war” announced the beginning of the preparation of the international conference in October 2017, in Italy, based on the resolution of the UN security Council, with the participation of anti-fascist organizations of the anti-Hitler coalition, the UN, UNESCO on the Association “Humanity inside the war” (Italy). The head of the Executive Committee of the “Immortal regiment of Russia” E. K. Kalgina noted the importance of preserving the historical memory of fathers and grandfathers who fought in the 2nd World war in Italy as well. According to the signed road map for 2017-2018.d. on the territory of the Republic of Italy will be presented photo exhibitions 45 cities of Heroes and military Glory (Russia). At the opening ceremony of the exhibition with a welcome speech by the Mayor of Massa Alessandro Volpini, noting the historical role of Soviet partisans in the Italian resistance, the President of ANPI Mass -Dino Oliviero Bedini, Vice-President of the ANPI Massa -Nino, Jenny, Consul General of Russia in Genoa -Anna Bulatova, Honorary Consul of the Russian Federation in the city of Florence – Girolamo Strozzi, Director of the cultural Center “the East” — March Candiani, President of the Association “Humanity within the war,” Anna Maria’s Zilli. It was also read out welcome speech of the Minister of Culture of RF Vladimir Medinsky, the Honorary guests of the exhibition noted that it was important to preserve the historical memory and to convey to the younger generation the events of the 2nd World war. At the event, the younger generation (school students), read their works on the theme of the guerrilla movement during the 2nd World war. The founder Of the Association “Humanity in war” – Paulo Pascalo told the story of his father, an Italian soldier, Ferdinando Pascalo and a group of Soviet partisans who acted on the banks of the don in the rear of the Germans, Italians and Romanians. Back in Italy Ferdinando Pascolo, under the pseudonym Silla, took an active part in the anti-fascist guerrilla movement in Italy. The exhibition honors the Soviet soldiers and prisoners who were part of the Italian RESISTANCE. Russian and Italian sides exchanged gifts. We Express our gratitude to the production company “Mcflag” for the provided souvenir products. The organizers of the photo exhibition were the Association “Humanity inside the war”, ANPI Massa, OOD Immortal regiment of Russia and the Fund”Zur Art”. The photo exhibition is supported by the Ministry of foreign Affairs of the Russian Federation, Rossotrudnichestvo, the state Duma of the Russian Federation, the Moscow city Duma and the Italian-Russian chamber of Commerce. The signing of the Agreement between the all-Russian movement “Immortal regiment of Russia” and the movement “Immortal regiment in Italy.”Italy, Verona. 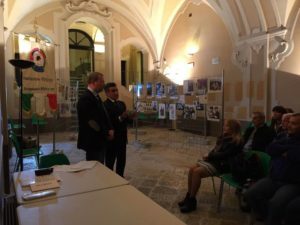 On March 2, took place the solemn opening of the photo exhibition “Russian “Garibaldi” Italian resistance” in Italy, in Verona. 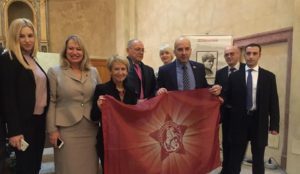 As part of The international photo exhibition “Russian “garibaldiytsy” in The Italian resistance”, an Agreement was signed between Italy and Russia, between the all-Russian movement “Immortal regiment of Russia” and the movement “Immortal regiment in Italy”.The document was signed by co –Chairman of the Immortal regiment In Russia, Deputy of the state Duma of the Federal Assembly of the Russian Federation, public figure Nikolai Zemtsov and President of the Association “Humanity in war”, founder of the “Immortal regiment in Italy” Anna-Maria Zilli. A historic event took place with the support of the Ministry of foreign Affairs of the Russian Federation, Rossotrudnichestvo, with the participation of the Deputy of the State Duma of the Federal Assembly of the Russian Federation Dmitry N. G., The Deputy of Moscow city Duma V. I. Ilyicheva, the Administration of the Moscow Patriarchate parishes in Italy, the National Association of Partisans of Italy (ANPI), of the city Hall Verona chamber of Commerce Verona, Industrialists Association of Verona and organized by the Foundation “Serart” (Russia) and the Association of “Humanity in the war” (Italy), the founder of which Paulo Pascalo (son of Ferdinando Pascolo ) established a relationship with the above-mentioned Italian organizations. Russian “Garibaldi” in the Italian resistance ” in Italy, in Taranto . The next stage of the project was to hold a photo exhibition “Russian” Garibaldi “in the Italian resistance” in Italy, in Taranto from 17 to 23 November. The exhibition was organized By the Foundation “Zur Art”, the Association “Humanity in war”, with the active participation of the founder Paulo Pascalo, together with the Association”VERSO EST”. The photo exhibition was held with the support of ANPI Taranto. 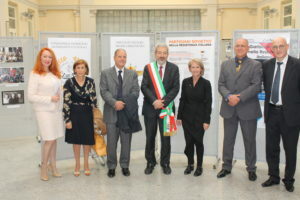 Fund “Zurart” (Russia) has initiated a long-term exhibition program “Russian (Soviet) “Garibaldi” Italian resistance”, dedicated to the local wars and conflicts in collaboration with the Association “Humanity in the war” (Italy) and the collection of archival materials on the territory of Italy. Fund “Zurat” was held with great success first in Italy a photo exhibition “Russian “Garibaldi” Italian resistance” in Udine from September 30 to October 10, 2016 in the building of the UDI University. At this event, the Fund “Zurart “came out with the initiative to create an” Immortal regiment”in Italy, which was officially registered on October 12, 2016 by the Italian Association”Humanity in War”. At the request of the Italian side, the photo exhibition was extended until October 17. In December 2016 Fund “Zurat” presented the project “women’s Hands” at the Christmas fair in Italy, in Bari. 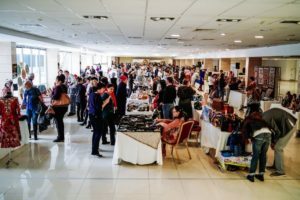 The products of masters of arts and crafts of the Russian Federation and CIS countries were presented at the fair. 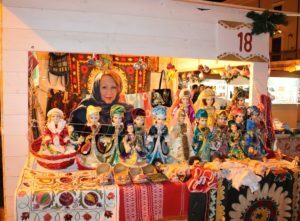 The purpose of participation in the Christmas fair is to show the identity of the culture of the peoples of Russia and CIS countries. The first Muslim trade and business center “Barakat”. Opening in Moscow International trade business center “Barakat”.Development of the concept, ideology. International forum-exhibition “Hands of women” from 2 to 4 March 2016 Kazan. From 2 to 4 March 2016, the international forum and exhibition “Hands of women”was held. The event was represented by about 85 regions of the Russian Federation, as well as more than 50 countries around the world. The opening of the forum-exhibition began with a meeting of round tables of the state Duma committees on labor, social policy and veterans Affairs Irina Sokolova “social support for motherhood, as the basis of statehood”, on the family, women and children Ushakova Elena Yurievna “Women in the legislature”. The round tables were held by the heads of the all-Russian women’s organizations “Business women of Russia”, “Union of women’s forces”, MOO “Association of women leaders” of Russia. International forum-exhibition “Hands of Women “presents ” online” and “offline” project in one person. The forum included an exhibition of arts and crafts. The project “women’s Hands” is a unique platform for uniting women of different confessions and political views, which discussed current issues: “Social support for motherhood, as the basis of statehood”, “Women in the legislature”, “Medicine: the role of women in health”, “the role of mother in the preservation of the native language and the development of speech”, “Women’s leadership and career”, “State policy of interethnic and interdenominational relations” and many others. International Exhibition And Forum “Hands Of Women”, St. Petersburg. 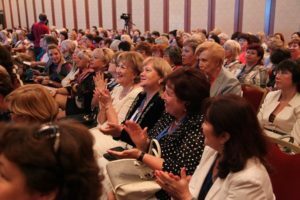 International Exhibition and Forum ” Hands of Women “in September 2015 took part in the” international Eurasian forum of Women ” in St. Petersburg. The project “Hands of a Woman” presented the project at a high scale level. The Eurasian forum is held by the inter-parliamentary Assembly of States, the Chairman of the Organizing Committee Is V. I. Matvienko – the Federation Council of the Federal Assembly of the Russian Federation. International women’s Congress “Women’s movement and the modern world” 21-23 August 2014 Kazan. The Congress brought together participants from over 20 countries: Brazil, Paraguay, Cuba, Benin, Bolivia, Rwanda, Switzerland, CIS countries and 25 regions of the Russian Federation. More than 400 representatives: women leaders, scientists, health workers, women deputies at all levels of government, education, culture and women’s NGOs, as well as foreign ambassadors and diplomats, owners and top managers of companies.